This handbook was written to serve two convergent purposes. First, the handbook helps managers comply with standards, rules, and regulations of the Occupational Safety and Health Administration (OSHA). At the same time, the author also shows how occupational safety and health issues may be managed for best organizational results. The handbook provides theories and techniques for the management of occupational safety and health. 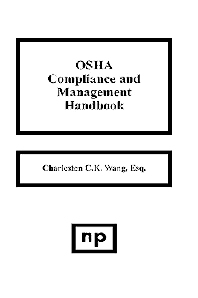 The material includes general information on the organization and workings of OSHA, as well as in-depth specifics on OSHA standards and procedures. It sets down the foundation for understanding OSHA in particular and occupational safety and health in general. With understanding, a goodùeven excellentùOSHA compliance and occupational safety and health management program may be designed and implemented within any organization. The reader will note that the handbook is written from the multidisciplinary standpoint, as it well should be for the field of occupational safety and health draws its information from many different fields of knowledge. As the author is a practicing attorney, as well as a hands-on certified industrial hygienist, over 150 important case decisions are cited with their case report references, and the author's commentary in this handbook. The reader may obtain and read these governing cases and achieve an elevated level of proficiency in the management of occupational safety and health. Beyond mere regulatory compliance, the information provided in this handbook will improve occupational safety and health and specifically reduce the rate of workplace injury and illness. In addition to managers, this book will be of benefit to engineers, industrial hygienists, senior executives, first line supervisors, and all other persons whose jobs are touched by OSHA.